"Do you remember when you believed in magic? For years Papa Jack has created and sold his famous magical toys: hobby horses, patchwork dogs and bears that seem alive, toy boxes bigger on the inside than out, ‘instant trees’ that sprout from boxes, tin soldiers that can fight battles on their own. Now his sons, Kaspar and Emil, are just old enough to join the family trade. Into this family comes a young Cathy Wray – homeless and vulnerable. The Emporium takes her in, makes her one of its own. But Cathy is about to discover that while all toy shops are places of wonder, only one is truly magical..."
The description for this book seriously makes me want to just squeal with delight--but I won't of course, because I'm much more dignified than that (or so I like to pretend). 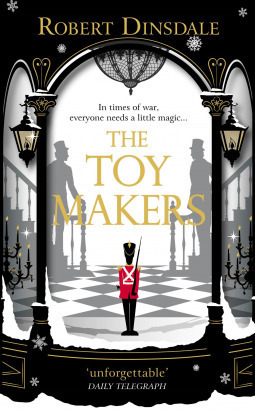 But in all honesty, I love everything about this description and cannot wait to finally have a chance to read The Toymakers. I really love that cover, as well--it really helps set a great tone for how this book sounds. That cover is basically perfection, and this story sounds so sweet!